Easter is pretty low key in our household. Our holiday usually involves church followed by a hunt for their baskets and lunch. We use to host an open house luncheon. After we would visit my mom with a plate full of food for dinner. Since my mom died, we've spent the last couple Easters with friends instead of hosting a lunch at our house. Not wanting to go empty handed, I took a look around my kitchen trying to think of what to contribute to their meal. And, it hit me - deviled eggs! I have a ton of hard-boiled, colorful eggs that only I will eat. Why do I have so many eggs? The one Easter tradition I delight in is dyeing eggs. I know most of my mom friends cringe, but I love to do this with the kids. There is nothing fancy or artistic about these eggs. I just get a kick out of watching them color eggs in a variety of colors, usually until they turn a drab brownish color. Last year, I posted a picture of the kids hard at work on their eggs. A friend found our way of dyeing eggs, "interesting." I say, "show me a better way." I've tried the egg in a whisk and it didn't work for me. The egg cracked each time I put it in the whisk. My best advice is not how to dye the eggs, but to either enjoy it or skip it. Same with making deviled eggs. Someone else will always want to make them if they want to eat them. I happen to be the person who likes to make both. And, use muffin tins to for easy clean up. I used the store bought dyeing kits and followed the directions. The eggs turned out vibrant and perfect. I was so focused on the kids coloring the eggs and the faces they made, I never took a picture of the finished product. 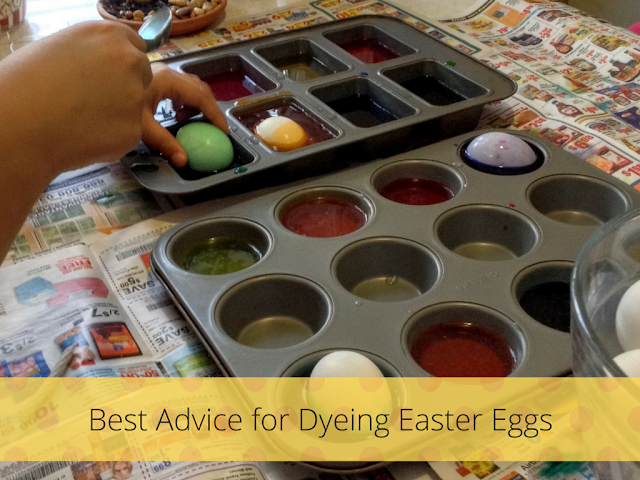 What is your best tip for dyeing eggs?